Let’s do something for the people in Africa and around the world! and as a result, millions of people have become homeless. but we can put ourselves into their shoes and feel their sufferings. Moreover, maybe you are thinking about how we can attend to their needs. If you want to do more, you may consider setting up a booth to offer handicrafts, cuisines, desserts, etc. Every penny collected will be given to the needy. 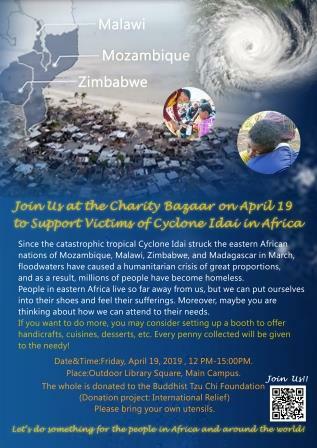 Date&Time:Friday, April 19, 2019 , 12 PM-15:00PM. Place:Outdoor Library Square, Main Campus. 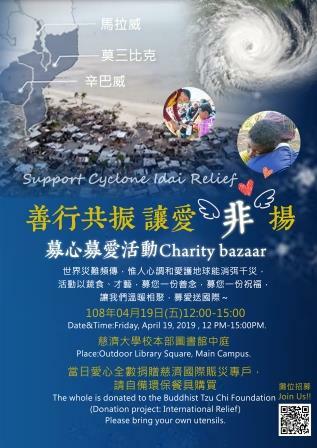 (Donation project: International Relief).Please bring your oen utensils.